Around 23:30 on 31 December 2008, an Israeli warplane fired a missile at Najma Parc, a small green strip in the main street of the residential al-Shaboura neighbourhood in Rafah, killing two civilians and injuring dozens of others. Iman Abu Areeda (34) was one of the two casualties, killed by a piece of shrapnel that penetrated her brain. Seven members of the extended Abu Areeda family who were also in the house at the time of the attack were mildly injured by shrapnel. The Abu Areeda family was displaced for several weeks after the attack as the external walls in the front side of the house were destroyed. The internal walls and furniture were also damaged. It was about half an hour before midnight on 31 December when electricity in the area was cut. Iman went to cover her youngest son, Mohammed, who was sleeping in his room. As she was leaning over him, the missile hit a few dozen meters away from their family home. The shrapnel that came through the outer wall killed her. Iman left behind her husband Mahmoud Abu Areeda (now 39) and their 7 children: Majd (20), Randa (19), Basel (18), Hibba (14), Islam (12), Watan (9), and Mohammed (6). “My mother died when I was 15 years old. It was the age that I needed her the most. I was in shock and I couldn’t believe that she died. I still do not believe it. I felt like not going to school any longer but I pushed myself and kept going because I know she would have wanted me to do so,” says Iman’s second oldest son, Basel. His siblings, Majd, Randa, Islam and Hibba have been badly affected psychologically by the death of their mother. Since the attack they prefer to be by themselves, isolated from the rest of their family. Randa, Islam and Hibba received psychological support from a local NGO to deal with their loss and the traumatic experience of the attack. After a while their family noticed they started to recover and were able to interact again with the people around them. His brother Basel also faced difficulties in finishing his high school exams successfully. “Before the death of my mother I used to get high scores but after her death my scores dropped. My tawjihi was a disaster but thanks to the help of my uncle, the brother of my mother, I made it and I am now in university. I’m studying journalism,” says Basel, holding one of his notebooks. 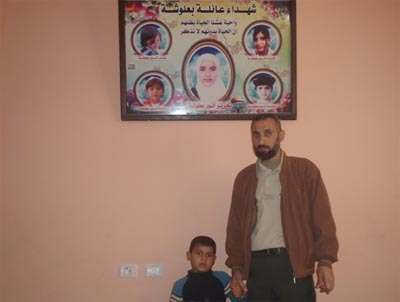 PCHR submitted a criminal complaint to the Israeli authorities on behalf of the Abu Areeda family on 2 July 2009. To-date, no response has been received. Iman and Talal Hamdan standing in front of a picture of their killed children Hiya, Lama and Ismail. Talal Hamdan, 47, and Iman Hamdan, 46, are quietly contemplative about life since the loss of their three children Haya, Lama, and Ismail. The children were aged 12, 10, and 5 respectively, when on the morning of 30 December 2008 an Israeli F-16 dropped a bomb in the area they were walking in Beit Hanoun, killing all three. The children were walking with their father to a nearby rubbish site to drop off household waste when Israeli forces targeted the area. The children were the youngest of the couple’s children, and they have not had any other children since the attack. Though none of the previous three years have been easy on the couple, for Iman the hardest period was directly after the attack, when she found herself in deep shock. “After the death of my children I could not cry, I did not have the space to properly mourn them,” says Iman, “but when I finally became alone. I couldn’t stop my tears.” Iman believes the shock of the incident has greatly increased her physical health problems, which include severe back and leg pain. “I barely sleep at night, maybe two hours during the day,” says Iman. Her grief is compounded by the experience of losing her father, brother and two cousins all on the same day during the first intifada. Contemplating the approach of the upcoming anniversary, the couple speak about how they will face it. “On the day of the anniversary I will try to keep myself busy to avoid thinking about it too much” says Iman, “but I don’t visit the graves, I couldn’t bear it”. The couple now have young grandchildren living with them, one of whom is named Ismail after their killed son. “We try our best to make up for our loss with Ismail, we go up and see him and spend time with him every morning,” says Talal. Before the attack Talal had worked in construction. He tried to return to work after the attack, but nerve damage in his legs and arms as a result of the attack have left him unable to continue working. The family now survive on UN food aid and help from their two sons. PCHR submitted a criminal complaint to the Israeli authorities on behalf of the Hamdan Family on 21 July 2009. To-date, no response has been received. At around 00:00 on the 29 December 2008 an Israeli aircraft attacked the Imad Akel Mosque situated in Jabaliya refugee camp. The attack destroyed the home of Anwar and Samira Balousha, which was situated just three metres from the mosque. Five of the family’s eight daughters were killed as a result of the bombing, which caused the family home to collapse on top of them as they slept. Five others were injured in the incident and other homes in close proximity to the mosque were completely destroyed. In the main room of the reconstructed Balousha family household stands a portrait of the family’s five deceased daughters Tahreer, Ikram, Samar, Dina and Jawaher who were 18, 15, 13, 8 and 4 respectively at the time an Israeli F-16 dropped a bomb on the Imad Akel Mosque, 3 metres from the family home. The family have since had one new comer to the home, Tahrir (named after her deceased sister); but for father Anwar “the home still feels empty, it is like there is gaping hole where my daughters once were, and despite feeling their presence with us all the time there is a huge sense there is something missing”. While his face and composure gives little away in terms of the suffering his family has gone through, Anwar’s words are clear regarding the effect the incident had on himself and his family. “My wife has been badly affected, just yesterday there was an UNRWA crew demolishing the wreckage of one the neighbours’ homes destroyed in the war to make room for its reconstruction, it reminded Samira of the war and she started to cry”. Anwar himself says he spends a lot of time at the daughter’s graves talking to them about daily life’s small comings and goings, “I miss them all the time, sometimes I even go to look for one of them in the house in the split second before I remember they were killed”. The families remaining children have been traumatised. Anwar describes how Iman, 20, who had a very close relationship with her older sister, Tahrir, and who watched her sister Dina die in her arms following the attack, seems often to be lost in her own thoughts; “sometimes I call her but she cannot even hear me” says Anwar. Despite being very intelligent Iman’s grades have suffered as a result. He also fears that his son, Muhammad, who was recently treated for a shrapnel wound in his foot, suffered during the attack, will grow up wracked by feelings of revenge for the death of his sisters. “He speaks of them constantly”, says Anwar, “he will not forget”. When asked by his father about his sisters, Muhammad says that “my sisters were murdered by the Israeli’s, they are in Paradise”. The three years since the attack has been a period of constant flux and displacement for the family. They have had to move home seven times in the past three years, each time creating a greater sense of instability for the family’s remaining children. “The children find themselves friendless each time they move area”, says Anwar, “my son Muhammad wanders off back to the neighbourhood of his old homes or to the local UNRWA school in search of friends, we can’t find him for hours and when he eventually comes home he says he went to find friends to play with”. They have only recently returned to their rebuilt home that was destroyed during the attack. Regarding hopes and fears for the future Anwar has mixed feelings. He is hopeful for the family’s legal case in Israel but he says “if they bring me all the money in the world they could not compensate me, I want my daughters, not money”. He is ravaged by fear for his children every time there is bombing and fears that he will lose them in the future. “Though this is my home I am seeking a future outside Gaza, right now I want to leave to make a new life for me and my family”. 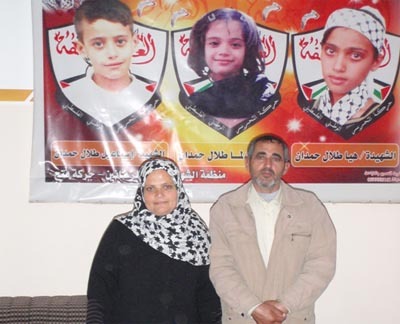 PCHR submitted a criminal complaint on behalf of the Balousha Family on 2 August 2009. To-date, no response has been received.